When you reach the point of tarot meditation, you may feel the Empress card reach up and pull you lovingly in. The warm embrace of a mother’s arms will surround you, and the feeling of being lovingly protected and encouraged will follow. 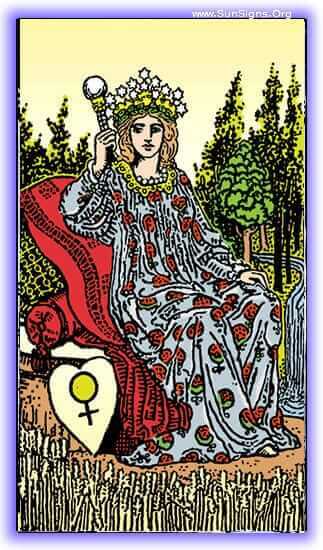 In this meditation of the Empress tarot card, you will find an abundant field, orchards in growth, and well shepherded flocks of animals. All is bright and in bloom, and in abundance, and all the good things of life are present. There may be other people around, mostly childlike in their appearance, and all well fed, happy, and content. They may be going about the business of tending and preparing the soil for growth, planting seeds and making sure all is ready. Somewhere amidst the orchards, fields, or manor house that you may find will be the Empress, lounging comfortable in a place where she can oversee all. She is firm, but loving, making sure that all things are ready for her children. She will see that everyone is well seen to and taken care of. She may take notice of you, if so, listen well and speak politely. She is the universal mother figure, and loves all equally, but knows when discipline is due. She may have motherly words of advice for you, or may merely acknowledge your presence. While you are there, observe the order of the place, the way that things are being conducted and prepared. Somewhere within this Major Arcana card’s message is one especially for you, something for you to take away. It may be verbal, it may be obvious, it may in fact be symbolic, but whatever it is, you would know it when you see it, even if you don’t know it’s meaning. If you keep a tarot journal, write what you felt, your emotions and what struck you as important. Pay attention to the details of getting stuff ready. Report what stood out to you, where you feel you could make improvement, or an affirmation of already being ready. The lesson of the Empress tarot card meditation is love, fecundity, and growth, remember that as you look for the lesson you take with you.